We've finally arrived at the final day of June. It's been a pretty busy month here on SuperPhillip Central, and it all concludes with one final review. 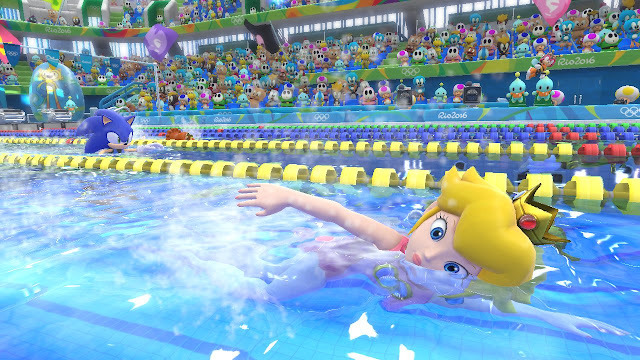 This time we're taking a look at the Wii U release of Mario & Sonic at the Rio 2016 Olympic Games. To see my thoughts on the 3DS version of Mario & Sonic at the Rio 2016 Olympic Games, look no further than this link. All of the fun of the Rio 2016 Olympic Games without the Zika virus. 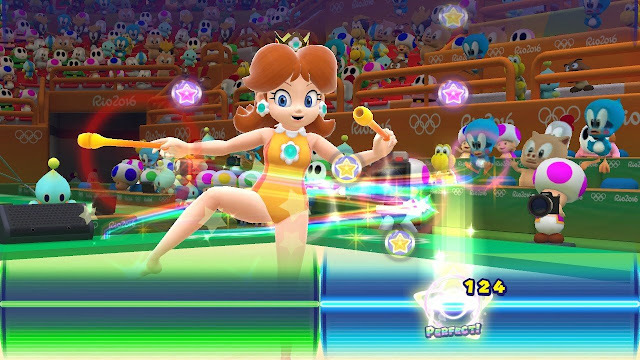 Every two years since 2008, the all-star rosters of the Mario and Sonic franchises have come together to participate in the Olympics, whether it's the summer or the winter. Many of these games have essences of fun in the package, but overall critics find they don't quite nail what they were shooting for. As a fan of most of Mario and Sonic's Olympic outings, I entered Mario & Sonic at the Rio 2016 Olympic Games on the Wii U with an open mind. The overall game ended up being one of my favorites in the series, but not without some glaring faults. The main attractions event-wise are Football, Beach Volleyball, and a first for the Mario & Sonic series, Rugby Sevens. I call these the main attractions because they're most in-depth and enjoyable events in the game. Alongside the traditional versions of these events, there are also Duel events. These involve the same gameplay of the original events, but throw in some wacky stipulations and bonuses. 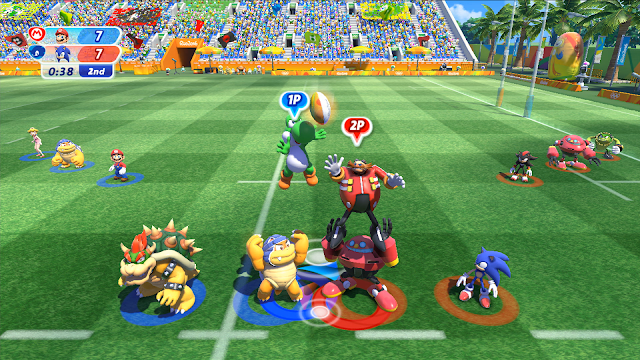 The new event Rugby Sevens is one of my favorites of the event bunch in this Mario & Sonic. Duel events don't score players the same as the traditional versions. Instead, you accumulate reserve points through attacking foes with items and other means. When you finally score, you earn all of the points that are in reserve. Each side has their own points in reserve, and if the other team scores, their reserve points are cut in half. It's paramount to rack up lots of duel points in reserve and then score to stand a chance in these Duel events. An unlikely duo tears up the sand together in Beach Volleyball. For instance, in Duel Rugby Sevens, you not only get duel points for attacking opponents with items, but you also can rack them up quite quickly by running through rainbows that appear on the field when you have the ball. This causes your player to quickly spin around temporarily, allowing you to slam into opponents, simultaneously knocking them down while increasing your points. Once you reach the opposing side's scoring area, your accumulated duel points are officially earned. Unfortunately, the three Duel events are about as wacky as the events get in the latest Mario & Sonic. A mainstay of these games since the original on Wii in Beijing was that of Dream Events, where the cast of Mario and Sonic all-stars played fantastical versions of various events across numerous Mushroom Kingdom and Sonic series locales. These are sadly not incorporated into Rio 2016, and it's quite disappointing, as those events really brought a lot to the series creativity and entertainment-wise. The Duel events, while still enjoyable romps, aren't satisfying enough replacements to Dream Events. Mario & Sonic at the Rio 2016 Olympic Games marks a turning point for the Mario & Sonic Olympic series. This is the first home console version without motion controls. Instead, you're using pure analog button goodness this time around, so the game is much more inviting to those who hated the waggling of the Wii Remote and other motion controls usages of past Mario & Sonic games. The actual controls work and respond well for the most part. Events like the 100m where you have to mash on a button to accelerate and boost remain as simple as ever. More complicated events like Football and Rugby Sevens play well, too, though they do occasionally have the problem of not switching to the correct player near the ball when you manually change players. This can be very frustrating especially when you're trying to defend your side of the field. Jam on that A or 2 button like you mean it! You've got a 100m race to win! There are a lot of different button combinations and usages of said buttons to remember, but thankfully, you don't have to. At the beginning of each event, you can press the minus button to bring up the controls for both the Wii U GamePad and the Wii Remote, as well as general info on when to use a given button in the upcoming event and gameplay advice. With over 15 events in total, this is an absolute lifesaver. Well, technically, knowing the buttons of an event in a Mario & Sonic game won't save a life, but it's a real help-- then again, you knew what I meant probably. Unlike the real Rio Olympics, the water in this pool is entirely safe to swim in. 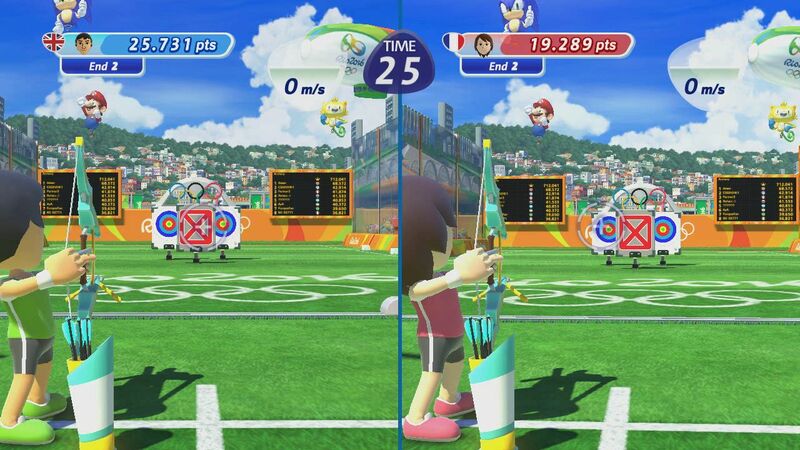 The main single player mode in Mario & Sonic at the Rio 2016 Olympic Games has you playing as your Mii, competing against other Miis through all of the game's events, traditional and Duel events. You get a selection of three events to choose from at a time, and you play through them in one of two ways. Either you start with a qualifier, then if you're one of the top four scores or times of the seed you're in, you move onto the semifinals, and then the finals. Or you face off against an opponent or a team in a traditional tournament. Either way you're trying to gain a medal with the gold or 1st place medals being the best, of course. Mii versus Mii in an archery showdown for the ages. Sometimes after an event has been completed, you are challenged by a guest character. If you beat them in the event of their choosing, you unlock them for play in that events. It's a bit disappointing that you can't play as them in all events, but then again, on top of the roster of already large number of playable characters, there would be even more that would have to be animated for all of the events. Perhaps it was a budget or time issue. It's understandable, then, but still a little deflating all the same. Winning events in the main single player mode earns you coins and rings that can be spent to push your luck at various stores. Here you can earn random goodies like Mii gear, music, and Miiverse stamps. You also earn Mii gear from completing a given event as well. To earn the rarest Mii gear, costumes of Mario and Sonic characters, you eventually unlock a mode called Carnival Challenge that sees four parade floats based on the characters of the Mario and Sonic series flow into the hub of the game. A random character appears on each float, and proposes a different challenge to you based off one of the game's events. Pass the baton with perfect timing to get a super boost as fast as Sonic's speed. This time around, it's not just about winning, but it's about doing so while fulfilling a challenge. For example, using Rugby Sevens again, one challenge requires you to score at least four conversions in one game. If you win the event but fail to complete the challenge, you don't earn a prize, and the cost for entry to try the challenge again doubles. Completing a challenge earns a costume piece from the character you beat, either a headpiece or a body costume of that character for your Mii. 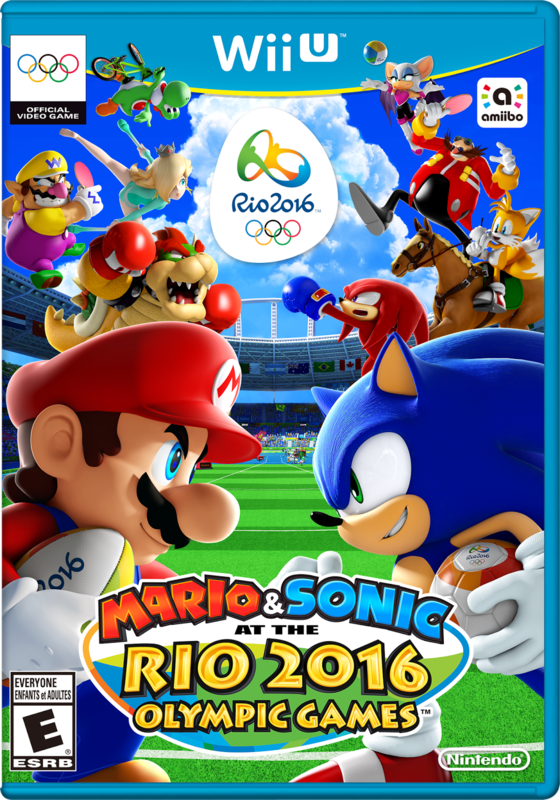 Mario & Sonic at the Rio 2016 Olympic Games sadly does not support online play at all. While playing the solo modes is fun by your lonesome, it's really not worth the cost of entry at full MSRP. The true Mario & Sonic experience lies within its multiplayer. The game even allows a buddy to play with you in the solo modes such as the tournament-style one I talked about earlier. It gives you double the chance to score the gold or 1st place medal, and it's just a ton of fun competing together for the same cause. Such a multiplayer mode that can also be played in single player against the computer is Heroes Showdown. This pits Team Mario and Team Sonic against one another, ten characters on each side, in multiple randomly selected events. When an event is chosen, you select the character or characters on your team that you think are best fitted for the event. If you win, the other side loses the character or characters that were in the event. However, it goes the other way, too, with you losing the characters that participated in that event if your side loses. The mode continues until either Mario or Sonic, the captains of either side, goes down in an event. Heroes Showdown is an enjoyable romp that can get very exciting, especially with two players on opposing sides playing together. One thing that cannot be denied about the Mario & Sonic Olympic series is that the games are absolutely phenomenal to look at each and every entry. This is no different with Mario & Sonic at the Rio 2016 Olympic Games. The graphics are colorful, vibrant, and crisp, and the performance is top dollar. You really get the impression that Nintendo and Sega have transported you to Rio... though a much more idyllic one than the real thing, without the Zika virus, sewer water in the swimming pools, and murder rates of the real place. 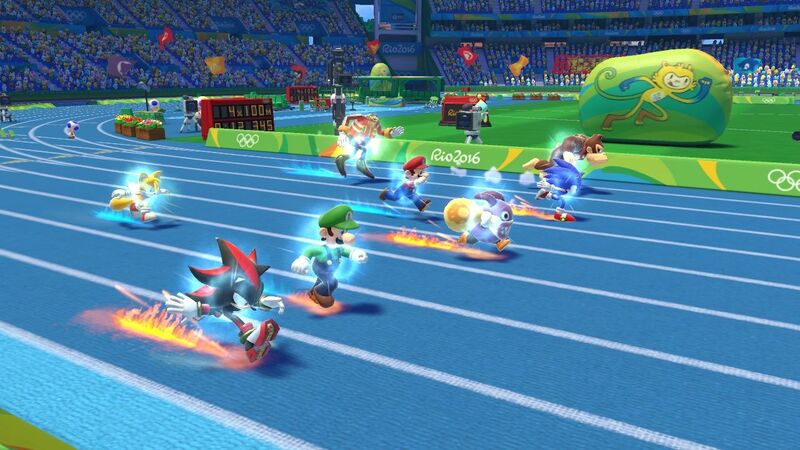 Sega pulled no punches with the presentation of the latest Mario & Sonic Olympic title. On the music side of the equation, there are much less new remixes of various Mario and Sonic series music this time around, which is a tad lame. 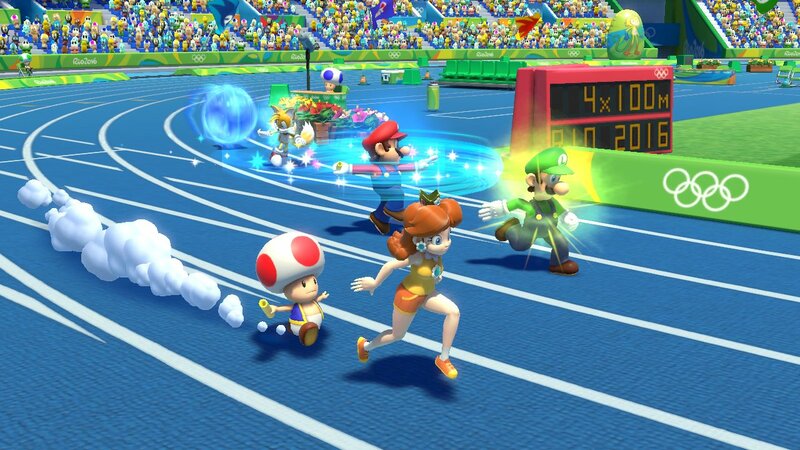 The majority of remixes come from past Mario & Sonic Olympic games. Still, the new content music-wise is fantastic, particularly the original stuff. If you have a buddy or series of buddies to play the game with in multiplayer, Mario & Sonic at the Rio 2016 Olympic Games really shines brightly. If not, then you have a game that you shouldn't pick up right away and should instead at least wait until it drops in price. Regardless of when you get the game, you should, as the Olympic events here are represented quite well, motion controls are gone, the presentation is top notch, and you'll get a wonderful challenge from the AI. 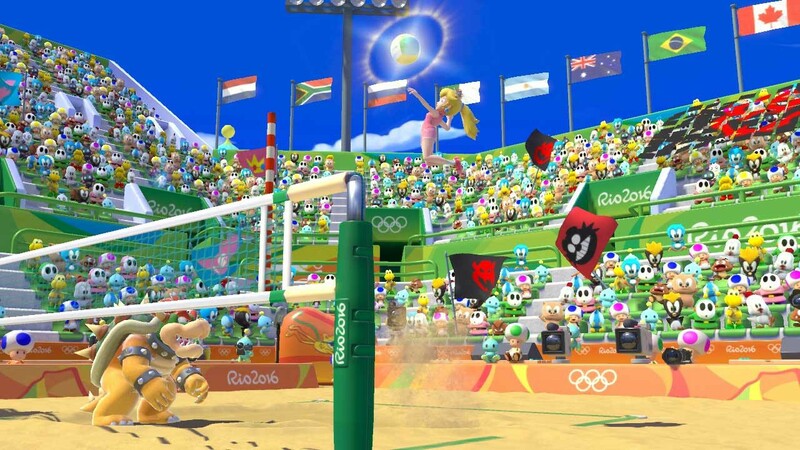 This is without a doubt one of my favorite of the Mario & Sonic Olympic entries, and it brings all the fun of the upcoming Rio Olympic Games without actually having to be there. And who the heck wants to actually be there with all the controversy and horrors going on there?